A few days ago, Punjab Government announced the 4753 seats for nurses through Punjab Public Services Commission. But the label ” Only for Females” badly hurts the Male Nurses working in several districts of the Punjab. In the 21st century, this Gender Discrimination is unbelievable. In fact, this is completely injustice with those males having domiciles from Punjab province. Although Nursing is always portrayed as the female-oriented profession, males also contribute a lot as they diversify and strengthen the nursing profession. In short, the importance of male nurses in the female dominated profession is undeniable. This is the reality in Punjab, male nurses are facing many problems as well as gender discrimination. They have no representation in government jobs and even they are not allowed to get training and education at government nursing institutions in Punjab. 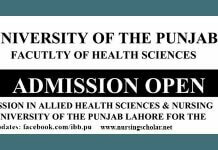 But the various institutes of Punjab offering nursing degrees to males which are registered with Pakistan Nursing Council. It really looks ridiculous that Pakistan Nursing Council has registered these institutes and males nurses too but they are constrained to do jobs in the private sectors at very low salaries. Khalid Bhatti ( Male Nurse) said, after spending five years and 6-7 lacs in completing nursing education he could not work in a governmental hospital because the government has not allocated any job structure for male nurses. Another Male Nurse added that Male nurses in other provinces and in the federal have equal rights although they are less in numbers. 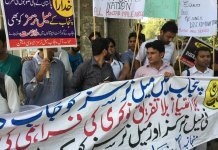 They have government Jobs, attractive salaries and are not banned being induction in government institutes, but in Punjab male nurses are at loss. 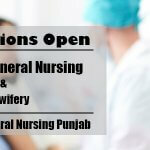 According to Punjab Health Nursing Service Rules 2014, the males can work in the government hospital as charge nurse, head nurse, nursing instructor and duty nursing superintendent. Despite these rules and policies, male nurses are a victim of the gender of discrimination. 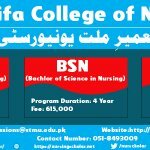 If Pakistan Nursing Council has established nursing institutes for female and male nurses in Punjab then why Director General of Nursing is not giving jobs to the Punjab domicile holder male nurses. If all male nurses can get equal job opportunities in different provinces of Pakistan, like Sindh, KPK, Baluchistan and also in the federal government, then why not in Punjab? There would be no gender discrimination in job opportunities according to Constitution of Islamic Republic of Pakistan 1973. Then why this gender-based dissemination seen in Punjab. There is a need to ensure the Punjab Health Department’s implementation of Nursing Service Rules revised in May 2014 Ref No. SORIII (S & GAD) 1-23/2003 where it’s written that equal opportunity for male and female nurses in Punjab. The main question behind this matter is the negligence of Punjab Government and Pakistan Nursing Council due to which thousands of male nurses are suffering. Pakistan Nursing Council should stop this gender inequality, break the gender-stereotype and take revolutionary steps to accommodate males in the nursing services.